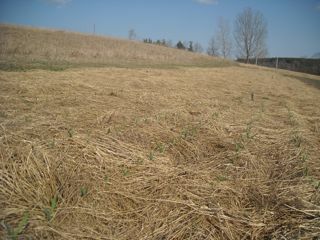 Ready or not, things are growing! We were already excited about the coming season, and then we had a week of weather in the twenties during which to start our first seedlings and finish constructing a small greenhouse attached to the house. It’s definitely strange weather, but ideal for what we’ve been up to! 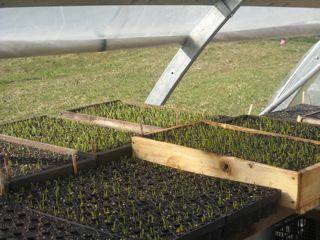 Here’s a peek into the greenhouse to see the earliest onion seedlings and into the garlic patch in the field where if you look carefully and you can see the first green shoots emerging. 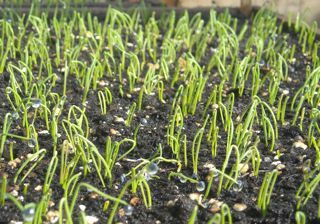 We proclaim our love of garlic at many times of the season, and seeing green shoots rising in an otherwise dull brown landscape is one of those times! Last Friday, Vandana Shiva was interviewed on CBC’s The Current as part of the Game Changers series. I was lucky enough to meet Vandana Shiva while in India several years ago and I can attest that she is even more fiery in person! She does a wonderful job of this interview, discussing seed sovereignty and food freedom. Worth a listen if you missed it – available on The Current website. Thank you to everyone who has signed up early for CSA shares, something that really helps us get the season started with the purchase of seeds and equipment. There is still space available in the CSA. If you are interested in becoming a member, visit our CSA Page for registration information and our FAQ about CSA page where hopefully you will find answers to some of your questions. We look forward to hearing from you!